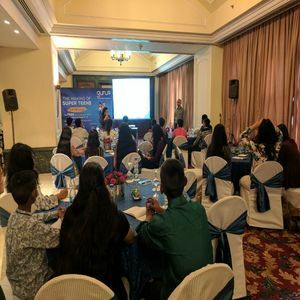 School students from Delhi, Gurgaon and Noida recently received exposure to some cutting-edge skills that are sure to go a long way in enhancing their lives and careers. GuruQ – a one-of-its-kind integrated digital platform that connects students and tutors – conducted a highly successful micro-learning program called GuruQGyaan created especially for students from classes 9 till 12 from June 27 till 30. GuruQGyaan was designed to resemble a corporate-style training session and received a tremendous response with over 650 students registering for it and 200 students attending the workshop across three location in Delhi-NCR. The micro-learning program was targeted towards teenagers looking to gain an extra edge in this competitive world. Participants eagerly lapped up the information from an assorted mix of modules covering Entrepreneurial Skills and Soft Skills to help them think out of the box and encourage their overall development. GuruQGyaan comprised an array of interesting topics including ‘How to make a Business Plan’, ‘Grooming & Personality Development’, ‘Sales, Marketing & Branding’, ‘Networking & Relationship Building’, ‘Time Management & Productivity’, ‘Communication Skills’, ‘Leadership & Team Management’ & ‘Motivation & Positive Thinking’. Students were highly impressed by the corporate-style presentation of the program comprising micro-learning modules of 90 minutes each with robust content to keep them engaged. GuruQ has already received several requests from participants as well as other students to hold more such workshops. The learning modules were adapted for school students and were made fun through a combination of diverse media including visual imagery, memes, videos etc. and were conducted by industry experts and professional trainers. All the modules were informative and covered important topics like leadership, positive thinking etc. In just two days, I learnt techniques and tricks that I will use over a lifetime. This program has added immense value to me.,” she said.